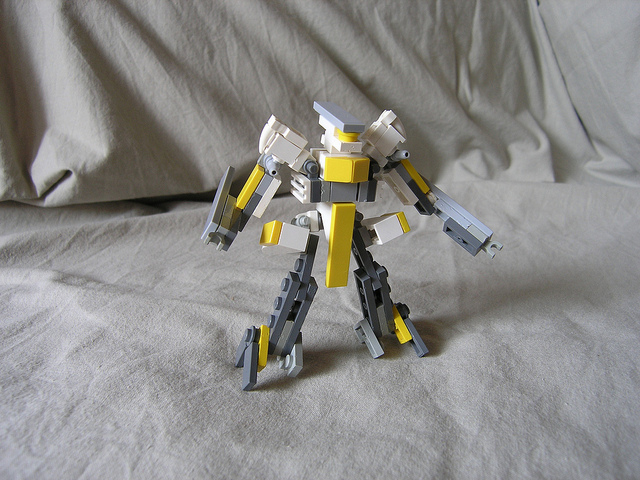 I've been sitting on this one for a while because I've been waiting for Bricklink inventories that still aren't done. But since some of these sets are getting marked down now, I went with Brickset to finish it up. 70348 Lance's Twin Jouster -- 216 for $19.99. Good parts in Black, Dark/Light Bley, Dark Blue, Trans-Orange, and White. It's also $0.09 per piece. 70358 Aaron's Stone Destroyer -- 251 for $24.99. Tons of parts in Dark/Light Bley, and plenty of Ball Joints. 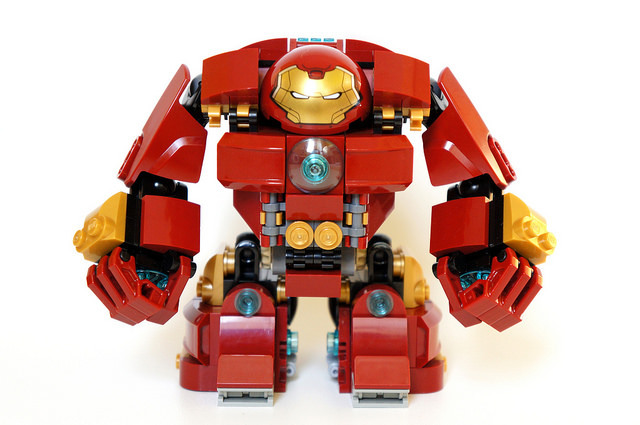 70624 Vermillion Invader -- 313 Pieces for $29.99. Tons of useful pieces in Black, Light/Dark Bley, and Red. Plus some neat overmolded Minifig weapons. 70626 Dawn of Iron Doom -- 704 Pieces for $59.99. This one's outside of the normal price range I recommend but, it has a good PpP ratio and there are a lot of good pieces in the set. 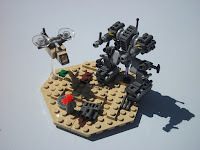 70623 Destiny's Shadow -- 360 Pieces for $29.99. $0.08 Price per Piece and it has Olive Green Exo Force Arms! 70622 Desert Lightning -- 201 pieces for $19.99. Same as 70624, but you can find this one at less than retail in Target right now. 41307 Olivia's Creative Lab -- 91 Pieces for $9.99. A bunch of useful pieces in a range of colors. Thank you, Friends. This one would probably be really good for a parts draft. I can't remember how I came across this but, it's another online rules site for Mobile Frame Zero: Rapid Attack. It can be switched between English, French, and Portuguese. Check it out. I'm feeling lazy, so here's some stuff to ogle. RX-7X 'Rhino' HAM by lego-nator. This is a neat diorama. Rex by Pasukaru76. 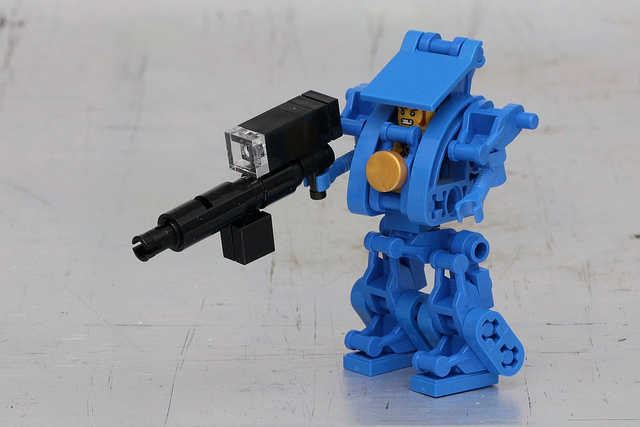 A nice 6P scale mech in my favorite color. 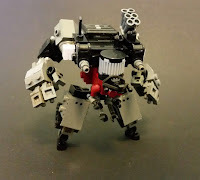 that might actually fit on a MFZ table. it a bit I think you could have something really fun. greebles and interesting techniques. My favorite bit is the fingers. Target has all Lego Star Wars, City, Friends and Duplo sets on sale for 20% off this week. Apparently these prices stack with Clearance prices, so you might want to hurry on this sale. Toys'R'Us has a BOGO40% off all Lego Minecraft, Nexo Knights, and Friends sets this week. This week I'm going to review the group of polybags I found at Barnes & Noble a while back. Bag. MSRP is $3.95 which is a Price per Piece of $0.12. Parts. A couple of Taps, Bar Plates, Trans-color pieces, Mudguards, and the Mod. Plate 2x 2x2/3 w/2 Studs on Side are the only things worth talking about. Build. I went with an IO Frigate. Score: -5 (B-). Lack of parts really hurt the score. Although it might be an easy way to get that tree if you don't want to deal with Bricklink. The Usual Suspects got together this past weekend for our second game of the month. We added a new person to the group this time around. 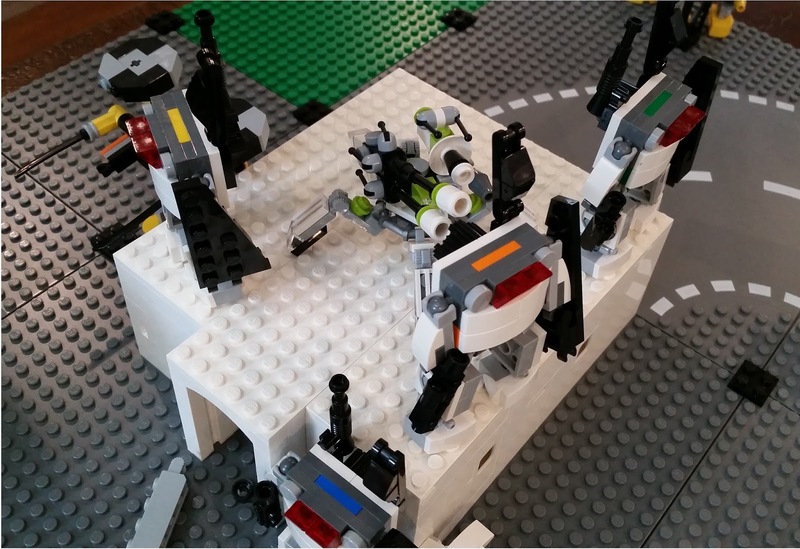 Back in February, the Seattle area MFZ group put together some really nice looking tables. The set-up for this game was partially in response to that. Occam's Spork (4 Frames & 12 Systems) = (6 Points per Asset) * (5 assets) = 30 points. Orange -- 2Rd/1B/1Y/2W + SSR (x3). Tom (3 Frames & 12 Systems) = (7 Points per Asset) * (4 assets) = 28 points. White Recon by Fire -- 2Ra+d8/2Y/2W + SSR. Orange Brawler -- 2Rd+d8/2B/2W + SSR. White Heavy Assault -- 2Rd+d8/1B/1G/2W + SSR. Events of Turn 1 (DDC@11): Occam's Spork, being Defender, chose to set up -- roughly -- at the top, inner corner of the bottom right baseplate. This blocked off seven out of the twelve full baseplates. This pushed everyone else on to a small strip along the left side or the far end of the battlefield. Narbey's White frame moves into cover behind a radar tower and hits Occam's Spork's Brown frame for 2, which then moves behind one of the jets for cover. Tom's Green frame hits Tyler's Orange frame for 1 and the building it was hiding behind for 1. Tyler's Orange frame hops up on to the building in response and tries to attack one of my frames. My Orange frame hits Tyler's Red frame for 1 then hops down off the building. My Blue frame moves towards Tom's Station and shoots Tyler's Red frame for 1 and the Fuel Tank it was hiding behind for 2. This destroys the Fuel Tank. Narbey's Red frame hits Tyler's Red frame for 1. Narbey's Orange frame hits my Blue frame for 4. Tyler's Green frame hits Narbey's Red frame for 2. Tom's White frame hits Occam's Spork's Red frame for 1. Tyler's White frame moves away from his Station and hits my Orange frame for 1, which then hops down off the building. Occam's Spork's White frame moves out from behind the radar tower and hits my Blue frame for 1. Events of Turn 2 (DDC@9): Occam's Spork's White frame seizes Tom's Station. Narbey's Red frame hits Tyler's Red frame for 1. My Green frame hits Occam's Spork's White frame for 1 and begins to move towards his Station. My Orange frame hits Occam's Spork's White frame for 3 in an attempt to blast him off the Station he just seized. In retaliation, Occam's Spork's Orange frame hits my Blue frame for 1 destroying it. I then retaliate with my Yellow frame, hitting Occam's Spork's White frame for 2 destroying it. Tyler's Orange frame hits Tom's White frame for 2. Tom's White frame then hits Narbey's Red frame for 1. Narbey's Yellow frame hits Tyler's Green frame for 3. Narbey's White frame hits Tyler's Red frame for 3 destroying it.Tyler's White frame hits my Yellow frame for 2 then moves on top of the cargo plane. Tom's Green frame hits Tyler's Orange frame for 3. Tom's Orange frame targets Narbey's Yellow frame and does 1 damage to it and Narbey's Red frame which was acting as cover. Events of Turn 3 (DDC@6): My Yellow frame hit's Occam's Spork's Orange frame for 2 and seizes Tom's Station. My Orange frame shoots the building for 2 damage, causing Tyler's Orange frame and Tom's White frame to fall. Tom's White frame takes 1 damage. Tyler's Orange frame high-tails it under the wing of the cargo plane. Tyler's Green frame hits Tom's White frame for 2. Narbey's Yellow frame hits Tyler's Green frame for 1. Tom's Green frame hits Occam's Spork's Orange frame for 1. Tom's Orange frame hits Narbey's White frame, which had moved on top of the jet, for 6, destroying it. Events of Turn 4 (DDC@2): My Yellow frame hits Toms' White frame for 2, destroying it. Tyler's White frame hits Narbey's Orange frame for 3. Narbey's Yellow frame hits Tyler's Green frame for 1. Toms' Orange frame hits Occam's Spork's Red frame for 2. Tom's Green frame hits Occam's Spork's Red frame again, this time for 4, destroying it. I seize Occam's Spork's Station with my Green frame which was trying to contest it. Pictures of the destruction of various Frames and Terrain. I was selected as Point Attacker by die roll. By a quirk of the scoring system, Occam's Spork was Defender even though he had more Assets than Tom. In the first turn we had an attack chain that involved all the players at the table. I didn't win, Tom's last set of attacks handed me the game. If I had come in with one less Attachment I would have had a much different point total and the game would have evolved much differently. I was worried that there wasn't enough cover on the battlefield, but it seemed to work out. We actually discussed the "Roof" rule pertaining to Elevation because of Frames hiding under the cargo plane's wings. Tickets for PAX Unplugged went on sale yesterday. PAX Unplugged is a tabletop games only version of the regular PAX conventions. It's going to be held in Philadelphia at the Pennsylvania Convention Center on November 17th to 19th. As far as I know the Indie Bazaar, the group Joshua A.C. Newman works with when doing conventions, will have a presence at the con. I believe there will be a Mobile Frame Zero presence at the con. I know several MFZ people in South Jersey have an interest in attending. MFZ players from the Mid-Atlantic states should be able to get to this con easily too. I'm hoping to be there, I hope I see you there too! Here's another new polybag that can be found at Target. Bag. MSRP is $3.99 which is a Price per Piece of $0.09. Parts. Some Medium Azure and Magenta pieces. Then there's that 1x2 Mod. Plate w/Ladder in Bright Light Orange, and a few other interesting bits. May the 4th is Thursday of this week. Toys'R'Us is running a $10 off $50 Star Wars Lego sets sale. They also have a 20% off Lego Marvel Guardians of the Galaxy sets sale. Lego is running a "Free" exclusive R2-D2 polybag set with $50 Star Wars purchase sale. At least in the United States. Europe is having a much nicer sale. Not sure if it's a sale, but here's what Target is listing for Star Wars Lego items. Now for something a little different after all the Batman content last week. Box. MSRP is $14.99 for a $0.10 Price per Piece. As you can see I got it on Clearance. Parts 1. The Printed Tiles, Truncated Cones, and Round 1x1 Tiles are nice. Parts 2. Yup, we've got actual rockets for our Single Shot Rockets. Parts 3. I like the "turbofan" 2x2 Round. Parts 4. The Gantry Brick is interesting, as are the Piping pieces. Build. A chunky Frame and a Station. Score: +15 (A). Very good for a licensed set.